Let’s face it. We all have a lot on our plates, which means that sometimes it difficult to get a healthy and nourishing meal on the table for your family at the end of the day. 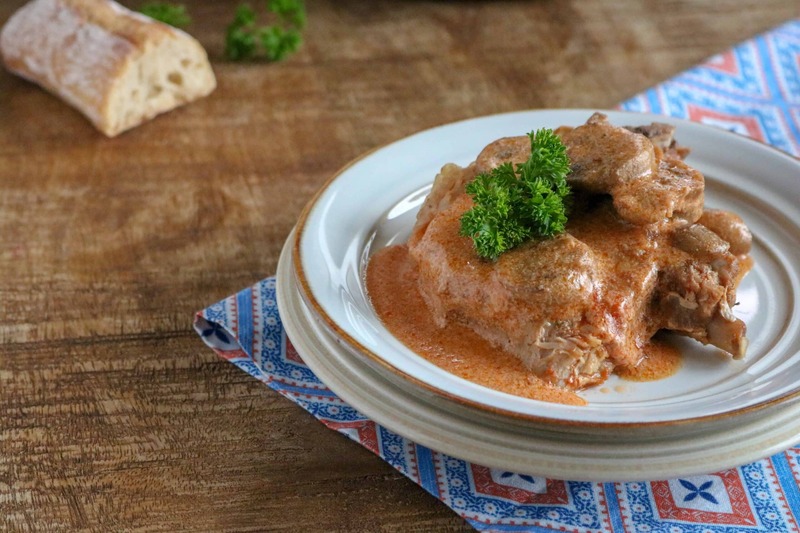 But, thanks to the Instant Pot and this amazing recipe for Instant Pot Pork Chops with Tomato Cream Sauce, that problem is quickly solved! So simple and quick to make, but so full of rich and satisfying flavor! It’s Easy to Make. There are only a handful of ingredients to gather for this meal and very minimal slicing, dicing or chopping. 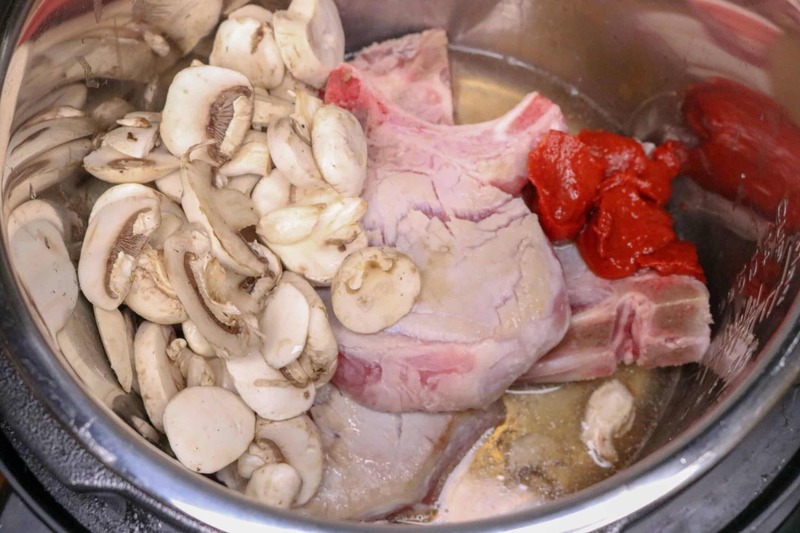 Slice some mushrooms and an onion, open and measure some tomato paste, add a little Worcestershire sauce, half and half and, of course, the pork chops, and you are ready to get cooking! Simple! They’re so tasty! Don’t think for a minute that minimal ingredients means minimal flavor. 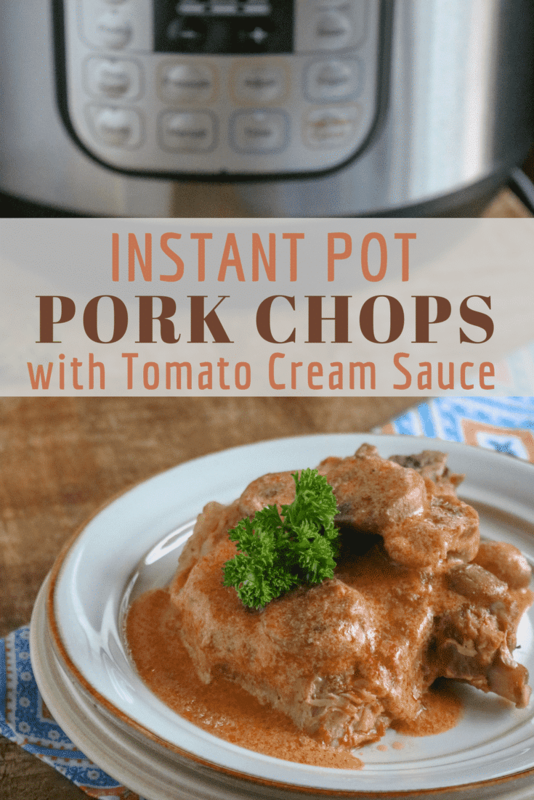 The tomato cream sauce on these instant pot pork chops is rich and flavorful. It may be easy to pull together, but it definitely tastes like it took some work. Using the Instant Pot. Thanks to the multi-function wonder that is the Instant Pot, not only is this dish easy to put together, but it’s done in the blink of an eye! Once you set the Instant Pot to cook, just walk away — it’s never been easier to make a quick and tasty dinner entrée. It’s so Versatile. Another reason to love these Instant Pot pork chops is that they lend themselves to pairing up with so many different dishes. Serve them up with delicious Garlic Mashed Potatoes (which also just happen to be Weight Watchers friendly). Add a tasty, light and healthy Cauliflower and Kale Salad and perhaps Green Beans with Caramelized Onions as a vegetable. If you have room, why not top off this awesome meal with a delicious and easy dessert such as No-Bake Pecan Clusters. There are so many yummy options! No matter what you choose to serve along with these Instant Pot pork chops, this tasty dish will earn lots of smiles and compliments! Step 1#: Turn the pressure cooker on to sauté mode, add oil and then brown the pork chops on both sides. Step #2: Add next 5 ingredients to the Instant Pot, and then cover. Step #3: Turn pressure valve to sealed. Step #4: Set manual pressure to 12 minutes. Step #5: Once pressure cooking time has elapsed, do a quick pressure release. Step #6: Remove pork chops and turn the pressure cooker back on to sauté mode. Step #7: Mix together cornstarch and half and half and then pour into the instant pot and mix together with the sauce. Cook on sauté mode to thicken. 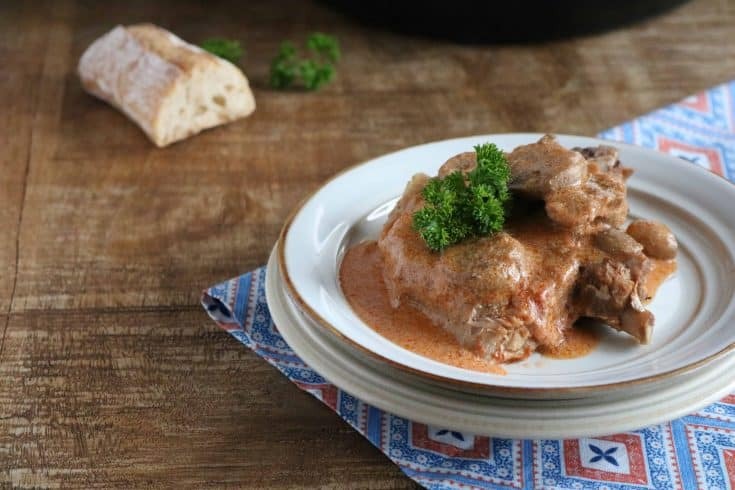 Instant Pot Pork Chops with Tomato Cream Sauce is simple and quick to make, and full of rich and satisfying flavor! Turn the pressure cooker on to sauté mode, add oil and then brown the pork chops on both sides. Add next 5 ingredients to the Instant Pot, and then cover. Set manual pressure to 12 minutes. Once pressure cooking time has elapsed, do a quick pressure release. 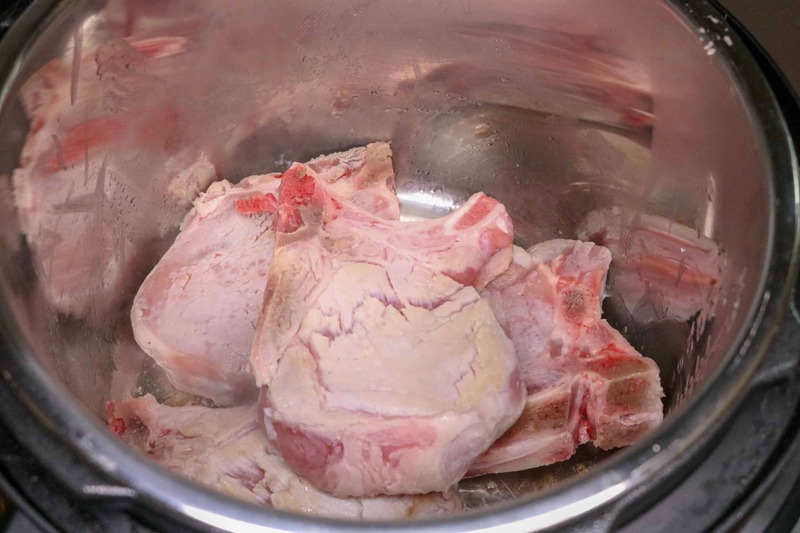 Remove pork chops and turn the pressure cooker back on to sauté mode. 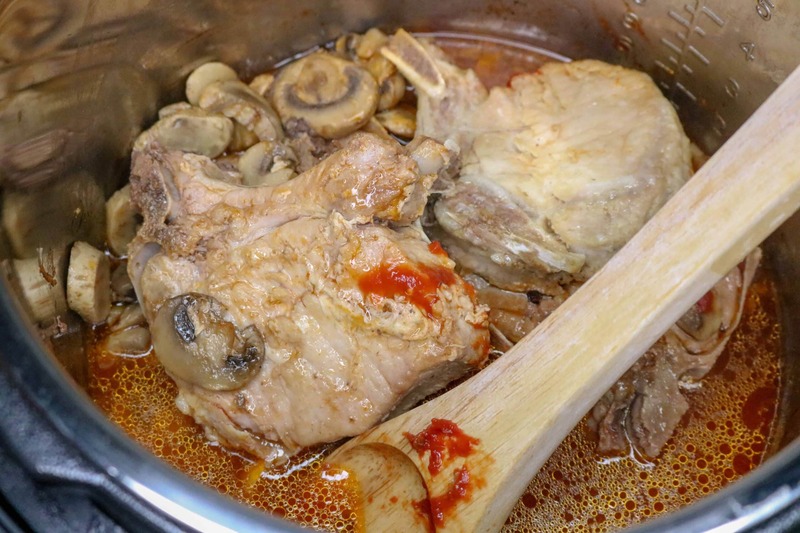 Mix together cornstarch and half and half and then pour into the instant pot and mix together with the sauce. Cook on sauté mode to thicken.